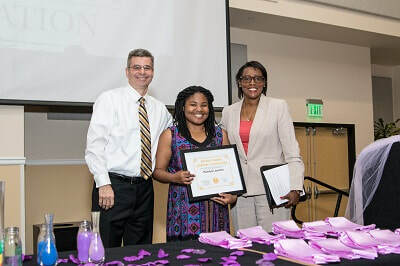 Inaugural scholarship winner Marklyne Joachim. Applications are reviewed by the PFSA Scholarship Committee. The Dively-Dupuis LGBTQ+ Leadership Award is $1,400 for one year, to be divided evenly in the Fall and Spring semesters. Preference will be given to students who are rising juniors or seniors when receiving the award. Applicant will have a cumulative grade point average of at least 2.5. Applicant will have demonstrated leadership and/or activism within the LGBTQ community on campus, in Orlando, the state, nationally or internationally. In 300 words or less, tell us who you are including your personal, educational and career goals. In 500 words or less, highlight evidence of your demonstrated leadership and/or activism within the LGBTQ community on campus, in Orlando, the state, nationally or internationally. Two reference letters and contact information for the references (Name, Telephone, and Email) must be provided. References should be from people who can a) attest to your current and/or potential level of service/involvement with LGBTQ activism; b) demonstration of integrity; and/or c) demonstration of leadership skills. You can make a donation to the scholarship fund through the UCF Foundation. Select Dively-Dupuis from the dropdown menu.